Whereas the divide between 'collector' play and open-ended adventuring previously fell with Will Ferell's 'Dad' character and his son Finn (Jadon Sand), this second entry shifts that generationally (as hinted at the end of the first movie) featuring his younger sister Bianca (Brooklynn Prince), happy to mix-the-bricks while Finn moves up to advanced sets and more concentrated world-building. 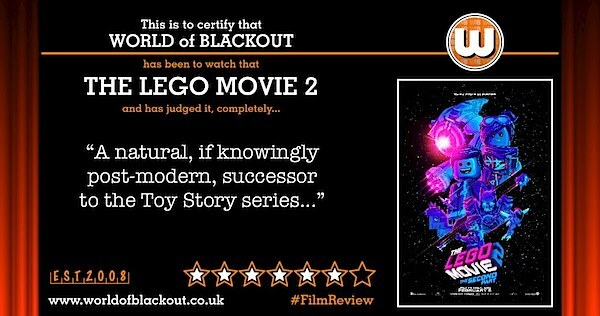 To properly facilitate this and illustrate that Lego™ can be enjoyed on a number of commitment-levels (because let's not forget that this is an unashamed two hour pay-to-view advert), the sprawling in-film, in-universe playscape now features pieces and characters from Duplo™ and Lego Friends™. Purists will squirm, and that's very much the point. Ferrell takes a back seat for this adventure, still voicing President Business in the animated story and the 'in another room' voice of Dad in the live-action. But Maya Rudolph capably takes the wheel as the squabbling siblings' embattled mother, deadpanning her role perfectly (even if the film's U-certificate means Maya's character can't give a screen-accurate rendition of the outburst in which stepping on a Lego brick in bare feet actually results). The live-action sections of the first movie were something of a third-act reveal, here they're dealt with head-on, interspersing the animated action throughout. The Lego characters don't (can't?) know the full extent of their real-world status as toys, but they're aware that their home has changed and there are larger, inexplicable forces at play. Rather than trying to iron out the differences between these two versions of reality, the script just carries on playing with them. By the end, the audience is no longer sure which events are the result of kids acting out a story and which are the in-universe characters themselves, continuing the narrative in their own time. 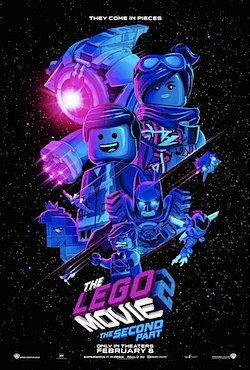 On a meta-level, The Lego Movie 2 feels like the natural - if knowingly post-modern - thematic successor to Toy Story. It's never as up-front as Pixar's flagship series and almost seems more believable (if that's the right word) as a result. As per this film's predecessor (and continuing the theme cemented by Lego Batman between), there are no Marvel characters to be found here. This, despite the Marvel-half of Lego's Super Heroes line being a mainstay of their licensing model. Instead we get appearances by the Justice League in full comic effect, with Warner Bros going so far as to rope in Jason Momoa*2 for light voicework. Indeed, Marvel are written out of the proceedings early doors with one cheeky line of dialogue. But not content to leave that where it lies, shortly after we have our hero (voiced by Chris Pratt, remember), blasting off into space for an adventure aboard his new ship, and talking to his plant as a co-pilot. Well, quite. And the playfulness with the leading man's back-catalogue doesn't stop there. A fairly telegraphed but still eminently satisfying sub-plot sees his character introducing a rapid succession of character-cards, each boldly proclaiming skills in a CV of previous adventures. Most of these appear to be nods to the actor's work in other movies (most notably the velociraptors, of course). 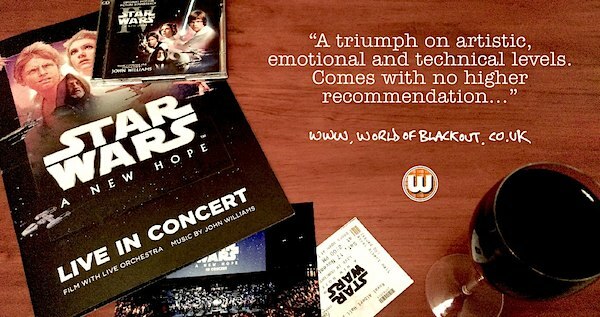 It's a testament to the sold writing that there's plenty here for a young audience, their associated grown-ups and the happy-go-lucky film geeks who've rocked up anyway. The Lego Movie 2 is absolutely packed with Easter eggs and is all the better for it. We're living through a golden age of animation of course, and we should stop for a moment to fully appreciate the craft of the Lego movies. Whereas the multitude of the corporation's TV-based features feature expressive, 'bendy' character models with working knees and elbows, the cinematic strand has used elements far closer to the relatively rigid toys themselves (with some artistic license). Along with photorealistic plastic texturing, their blocky structure and appropriately restricted movement is a faultless CGI simulation of traditional stop-animation, and I don't think that gets enough credit. The animators have deliberately placed this obstacle in their own path, making them work harder to achieve the same fluid level of visual storytelling, while also achieving an end result which looks closer to the actual store-bought Lego toys (did I mention that this beautiful film is also a two hour advert?)*3. It certainly earns a place near the top of everyone's list. It's possible I suppose, although you'd have to be a hardened cynic to really get nothing out of this. Level 1: Well, the film was written by Phil Lord and Chris Miller, formerly of the Solo parish, but since they left that production under something of a cloud, I suppose we'll have to go with this movie starring that uncredited Stormtrooper from The Force Awakens.